I was alone and sick in Andahuaylas, Peru, over New Year's of 2007. To pass the time, I went into town during the Sunday market to buy some vegetables. On my walk, I came across a man forcing a long stick into the mouth of a large pig. By long, I mean about 4 feet. And by large, I mean a couple hundred pounds. The man was probably 5 feet 6 inches, 140 pounds, and a pretty tough guy. I was walking by when, suddenly, he wrestled this unsuspecting pig to the ground. The pig screamed and wrestled back, but the man definitely had the upper hand. It wasn't a few seconds before the man grabbed the pig's tongue and began pulling it out of its mouth. When he had pulled out 4 or 5 inches worth of tongue, I thought, "surely that's enough tongue for whatever this guy has to do." But it wasn't enough...by far. 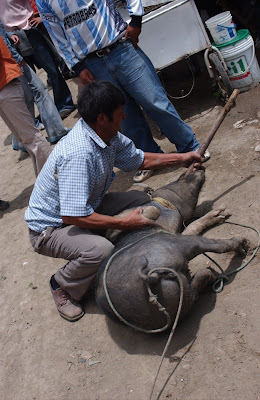 The man grabbed the long stick, shoving it down the throat of the pig, and somehow managed to pull out more pig tongue. I didn't know that pig's had such long tongues. After pulling out over nearly two feet of tongue, the man was apparently satisfied with what he saw, and so he let go of the pig. What surprised me most wasn't that the pig screamed, but rather how awful the scream was. It was long, loud, and piercing. It was awkward (for me). So I took a picture. I needed some clarity so I asked someone casually, "so what's going on with the pig?" Turns out the man was checking for foot-and-mouth disease, which for pigs shows up first in the back of the tongue. I had heard of foot-and-mouth, a disease that causes sores on animals bad enough to merit killing them before it gets worse. And I was glad that he was checking for it. Apparently people can't contract foot-and-mouth by digesting the cooked meat of animals who had the disease, but they can get it while those pieces of meat are being chewed. Turns out also that the pig-wrestling, stick-shoving man was paid by the pig's owner to check for foot-and-mouth. In fact, on that Sunday, he would check 5 or 6 other swine. The cost for his service: 2 soles per pig. Which, in US dollars, ends up being 70 cents. Sounds to me like good work in Andahuaylas. If you can get it. I dont even know what to think about the post but for some reason i feel enlightened.